Convert your PDF into a web flip book in 10 minutes. Upload a PDF, enter your email, customize it, and download it. It's painless, guaranteed. You will be allowed to download a watermarked version of your flip book free of charge and without entering any payment information. If you like it and want to get rid of the watermark, you can buy it at any time for only $34.95. Your PDF must weigh a maximum of 80 MB and have at least 4 pages. See our tips for getting optimal results. Your PDF file has been selected. Enter your email, and we'll generate your flip book within a few minutes. An error occured and your PDF could not be uploaded. Please try again. Thank you! You should receive an email from info@ezflippr.com within the next 10 minutes at .... This email will contain a link to customize and download your flip book. To create your flip book, all it takes to upload your PDF. 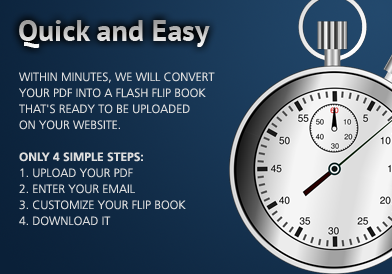 Within minutes, we will convert it into a flash flip book that's ready to be uploaded on your website. The entire process is automated for you. Quickly offer a valuable product to clients without any extra labor costs. 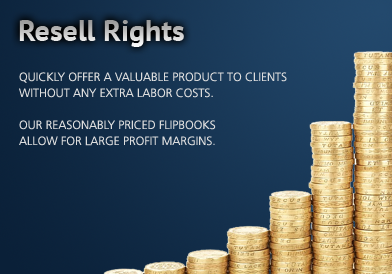 Our reasonably priced flipbooks allow enough space for large profit margins. 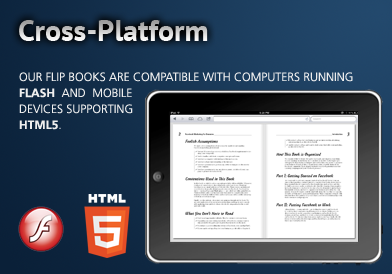 Your flip book will be compatible with PC and Mac computers running Flash, as well as mobile devices supporting HTML5 (such as Apple iPhone/iPad/iPod*, Google Android* and Windows 8*). Add clickable zones, videos clips to your flip book with our simple WYSIWYG editor. We are commited to provide you with the best simple cost effective flip book platform. You need a feature we don't yet offer? Let us know! Easy to use, and works as advertised. The best bang for your buck. © Copyright 2012-2019 NuageLab. All rights reserved. * iPhone, iPad and iPod are trademarks of Apple Inc., registered in the U.S. and other countries. Make sure transparency groups are flattened. You may achieve this directly in Adobe InDesign, or by using the "Save optimized as..." Adobe Acrobat function.